Every once in a while, you have to ask yourself how close we are to an age of Star Wars technology. Today, I found that the Institute for Creative Technologies (ICT) graphics lab has figured out a way to make holographic communication. As you can see, there is a holographic head in a box there, very reminiscent of Laddy the genie from Pee-Wee’s Playhouse. Unlike Laddy, the person can view the floating head in three-dimensions. What you don’t see is what is happening to the “head-guy” on the other side. 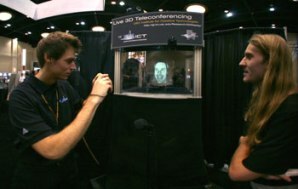 The head uses special cameras to get the information on the profile, and the project it onto a spinning mirror. Most holograms use lasers, but this uses a rotating mirror so that multiple images can be seen. There is a video of this here if you want to see a better demonstration. As the video shows, the image of the hologram looks a little sketchy, sort of like the hologram of Sir Lawrence Olivier in Sky Captain and the World of Tomorrow. I don’t really see this technology as something that would be in every household or business, but I suppose this would be a terrific attraction at some sort of amusement park. However, if it gets cheaper, and if the hologram looks better, we could finally be the holographic society from our science-fiction movies.